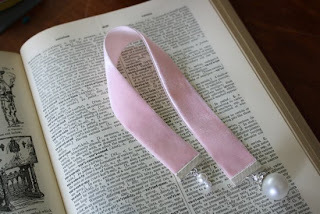 who recently posted a tutorial on these oh so romantic book marks! I have to say, I just love the muted color palette ~ this comes from someone who uses the brightest of paint colors! Inspired by the cover of Somerset Studio (see photo above), Tricia came up with her own twist on this romantic way of marking a classic read or as shown above, a wonderful way of making a stack of vintage books just shine. 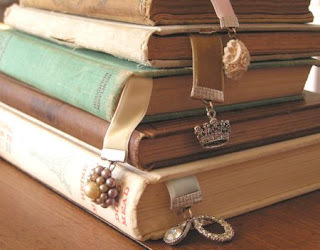 Above is Tricia's creation and it appears to look like a classic piece of jewelry ~ Jewelry for our library! So stop by Oh So Crafty's blog and learn the simplest way of turning wonderful pieces of scraps and vintage jewelry into something spectacular! Thanks so much to Tricia who allowed me to share with you her blog post!